The official reboot of the Tomb Raider series is now in its third chapter, with the prior two versions, Tomb Raider and Rise of the Tomb Raider, being smashing successes. 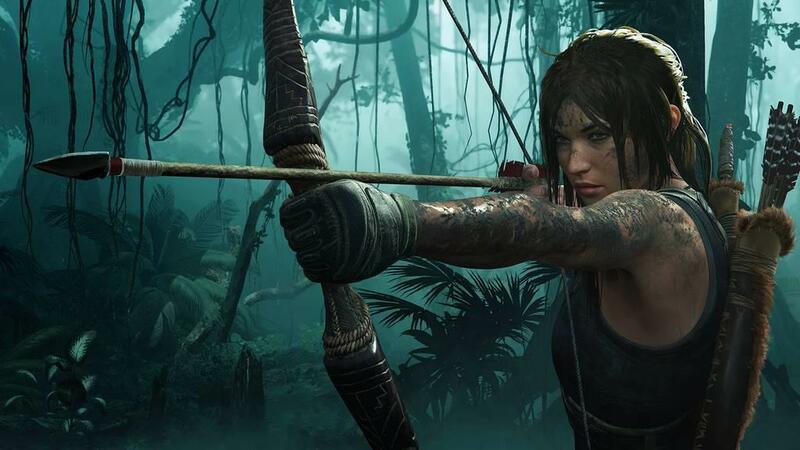 Crystal Dynamics’ treatment of the new Lara Croft, a younger version still learning the true ropes of survival and exploration, has been a refreshing take on a series that still had potential and just needed a kickstart from the right group. 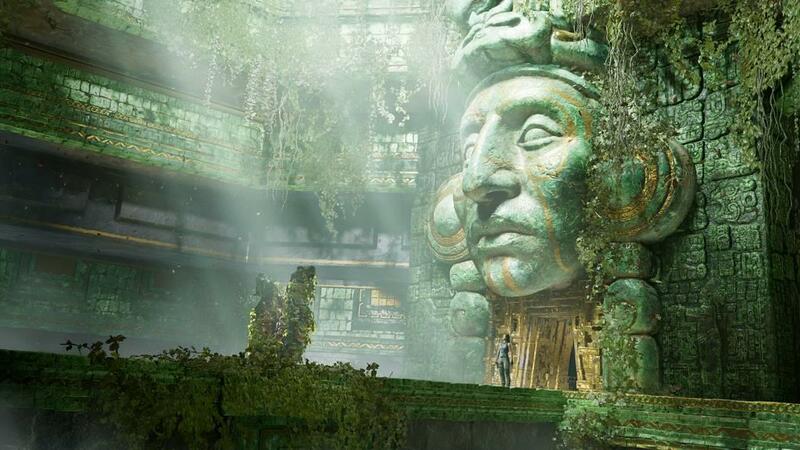 The third chapter is upon us, but Crystal Dynamics took a back seat to Eidos Montreal and the resulting product of Shadow of the Tomb Raider has taken one step forward but two steps backwards. Beating around the bush, this looks and feels like a Tomb Raider game from the start. Lara Croft’s journey in this new storyline features the same beautiful visuals that captured our attention from the first chapter. The layout of maps are carefully designed to ensure that basic exploration is easy to follow while finding treasure and hidden tombs prove to be a challenge, yet offer the same gorgeous visuals that will pull you in. I’m happy to see that Eidos Montreal didn’t mess with the formula there and stuck with the overall feel of Crystal Dynamics’ creation. The enemies, characters and creatures all encountered in the game have a true realistic feel to them. Early on, Lara is attacked by a jaguar deep in the forest, setting up a battle that takes us back all the way to the early games of Tomb Raider. This time, though, things make a little more sense. Remember asking yourself why a lion or tiger was in a long lost tomb and surviving no problem back in the early 1990s? Finding them in the jungle makes sense. Where things go awry is with some of the controls. 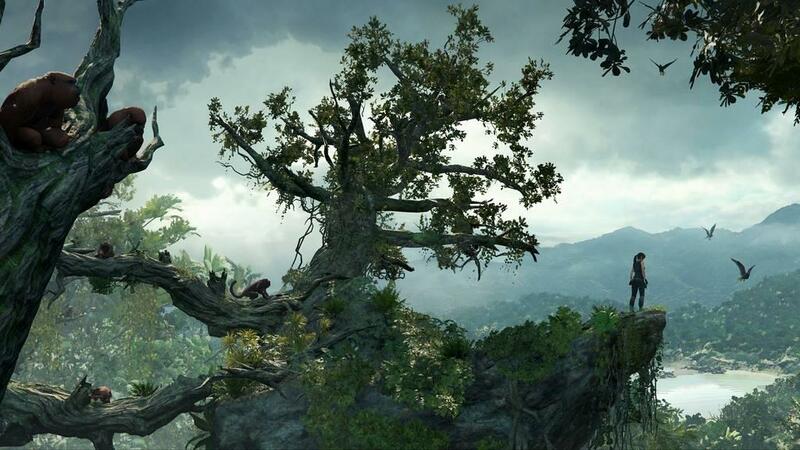 The core controls that Crystal Dynamics used in the first two games are there, but some of the new controls are clunky, especially when Lara is climbing on a wall. Almost all of my deaths in this game came from screw-ups with the control system when I attempted to either rappel down or try and simply jump from one section to another. Once is a coincidence, but poor Lara’s death count was in double digits by the time I was through playing this game. Combat in this game is suspect at best. The game definitely takes the Metal Gear approach and wants players to be as stealthy as possible, which is right up my alley. However, it felt too easy. I was playing on normal mode so it’s unfortunate to me that I could be against a wall out of view but not technically hidden and standing in light, have the Triangle button icon appear over the enemy’s head before he’s technically in Lara’s view, and just flat out blindside him without him having a chance. I feel as though if a stealth approach is how a game wants to go, I need to be truly hidden or sneak up behind someone. It’s a lazy approach, yet any stealth kill picked up seemed to be rewarded with more XP every time. I have to tell you that the bow was really the only weapon I utilized other than Lara popping out of grass like a Jack-in-the-box to coldcock someone with her axe. Experience: This one feels more like actual tomb raiding! I will say that I’m very happy with the new tombs and how many there are. The first game really lacked in actual “tomb raiding” without being too punny and the second game was so focused on the storyline that it felt like hidden tombs were just an afterthought, so getting into these new, plentiful tombs is very welcome. I’m also happy with the mechanics of swimming and the puzzles that are presented. 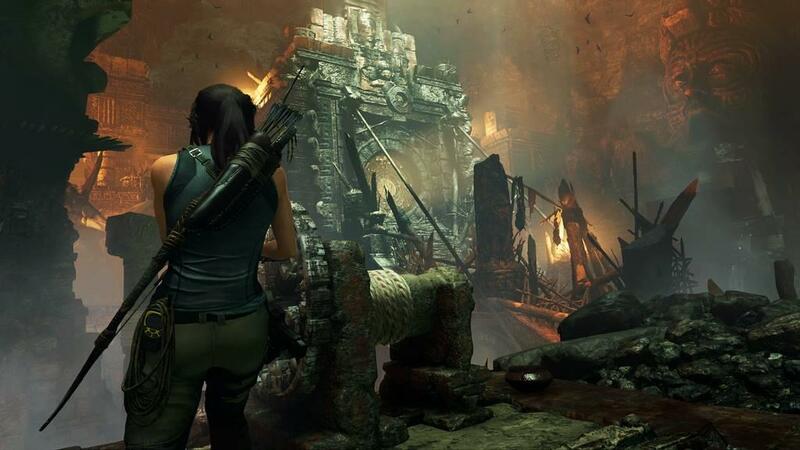 The difficulty mode will determine just how obvious the direction is for Lara to take and how much help the AI offers. 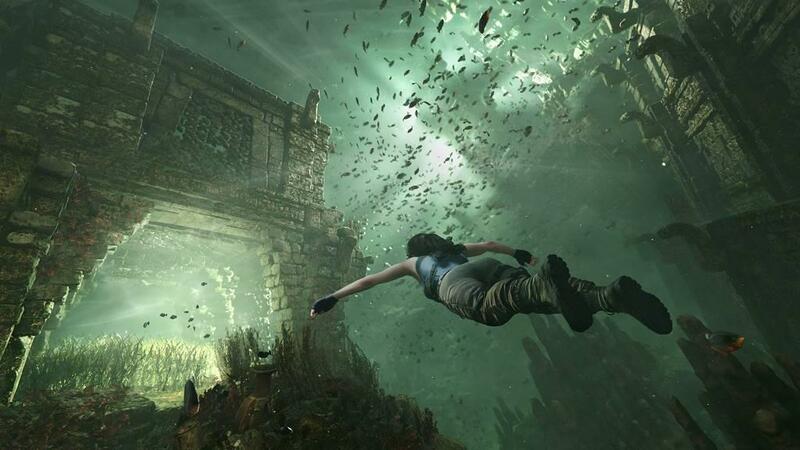 There is also a bit of nervousness every time Lara goes underwater and hoping that it’s not to a dead end. I have not felt that kind of stress taking a character swimming since I took Sonic underwater and got the dreaded five count for being under too long. Touching on the difficulty of the tombs, the game sets a good bar at the beginning for challenges and raises them up as the game presses on. Also, some of the tombs are well out of the way and do need some true exploring to find. The game will also tell you if you’re missing specific equipment in order to access the tomb, especially early on when Lara may not have her gear yet stumbles across one of these areas. The original versions of Tomb Raider were all about solving ancient puzzles and progressively got harder so it’s nice to see Eidos going back to their roots, something that I think Crystal Dynamics lacked as they focused on the storyline and gameplay instead of the puzzles. The story itself is so good early on but really misses the mark because so many things are teased yet never really come to fruition. Lara and Jonah are a fantastic pair, but I had hoped to see more development instead of Jonah seemingly being a helper and friend yet not really sharing a lot. The story with Trinity also kinda falls flat, even with them being the antagonist that Lara needs to defeat besides her primary quest. There’s only so much I can go into about the ups and downs of Shadow of the Tomb Raider. Early on I was quite excited as the picture painted for me was one that I really was ready to sink my teeth into. Tomb exploration made me remember why I loved the Tomb Raider series in the first place. However, the controls just felt off to me for some of the game. Combat really felt like an afterthought with the stealth approach being rewarded, forcing players who would rather take on wave after wave of enemy to change their style or get washed out of the game early on. I felt as though this game needed to go back to Crystal Dynamics to work on the combat system while Eidos Montreal handled the puzzle and stage design. Yes, Crystal Dynamics had some say in this as advisors, but this one is on the neighbors to the north. There’s a great game in here just dying to burst out and show us what we all want, but it just seems to fall flat when it really matters. I want to love this game, I really do. Unfortunately, all I see is an above average game that needed some desperate polishing at the end. Shadow of the Tomb Raider should leave us wanting more from the rebooted Lara Croft game, but with some clunky controls and a lazy combat system, what saves the game from being below average are beautiful visuals, fantastic puzzles and tomb layouts along with true adventuring. It’s as mixed up of a bag as one can get.